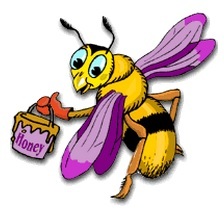 In this article you will come to know about the preparation of honey bee. Q. How do bees make honey? Ans. The bee extracts the nectar from flowers through its long tube like tongue and stores it in its honey sac which contains the enzymes that convert the complex sugars present in nectar into glucose and fructose. After the honey bee returns to its hive, it passes the nectar to other worker bees which keep on regurgitating it for further processing and then finally deposit it into the honey comb cells. After that the bees convert the viscous liquid into thick honey by fanning the honeycomb with their wings which causes the water content in the liquid to evaporate quickly. Finally, the cells containing honey are sealed with the beewax. Previous Article Why is water a good solvent? Next Article Why does our stomach make rumbling sounds?